Friends: Pope Francis greets a woman during his visit with Giovanni Traettino, a Protestant pastor and his friend, in Caserta, Italy, on July 28. Pope Francis said he knew people would be shocked that he would make such a trip outside of Rome to visit a group of Pentecostals, “but I went to visit my friends”. THE only name Pope Francis wants divided Christians to call each other is “brother” or “sister”. 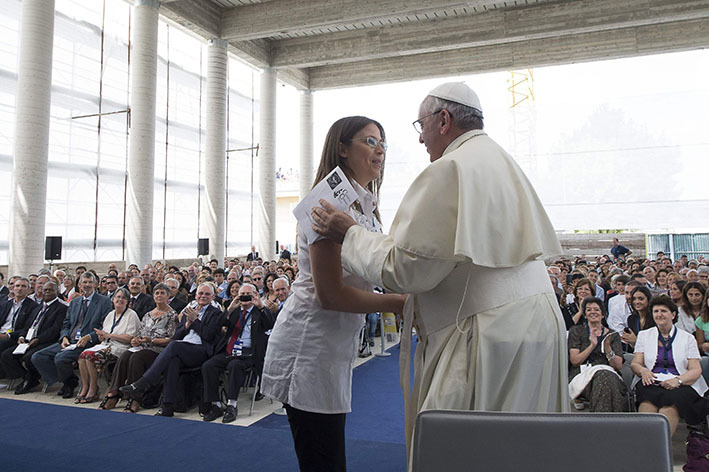 “When one walks in the presence of God, this brotherhood results,” the Pope told evangelical and Pentecostal Christians on July 28 in Caserta. The Pope himself acknowledged that some people would be shocked by his decision to visit a Pentecostal church; while the Vatican has had an official dialogue with some Pentecostals and evangelicals since the 1970s, by and large, Catholic-Pentecostal relations have not been easy. For years, “sect” was the nicest thing even Vatican documents had to say about the burgeoning Pentecostal communities in Latin America and Africa. The nicest thing many of those communities have to say about the Catholic Church is even worse. And even as Pope Francis was preparing his visit to the Pentecostal Church of Reconciliation in Caserta, the Italian Evangelical Alliance and other communities issued a statement sharply critical of Catholic Church teaching and, especially, critical of evangelical communities in Italy and around the world who hope for ecumenical rapprochement with Rome. The groups said they “maintain as incompatible with the teaching of Scripture a church that believes it is a mediator of salvation” and “a church that has assumed the responsibility of adding dogmas – like the Marian ones – to the faith”. “Apparent similarities with evangelical spirituality and faith in some sectors of Catholicism are not in themselves a reason for hope in a real change,” said the statement published on July 19. The leaders called on evangelicals warming to Rome to exercise “healthy biblical discernment” and focus instead on “bringing the Gospel of Jesus Christ to the whole world”. For Pope Francis, as for the popes who preceded him, that is a key point. Full unity in faith and the sacraments is the ultimate goal of ecumenism in fulfilment of Jesus’ prayer that his disciples would be one so the world would believe. But using the metaphor of setting out and walking with the Lord, a key image of Christian life for Pope Francis, the movement toward Christian unity is something that happens one step at a time. For Pope Francis, it is not about waiting for others to catch up with you. It is about everyone continuing to walk with and toward the Lord, supporting and learning from the brothers and sisters God places on the same path. The closer everyone gets to holiness, the closer they will be to one another. While Pope Francis’ gestures are new, the basic idea of growth in unity being the result of growth in fidelity to Christ is not. During the Week of Prayer for Christian Unity in 2012, Pope Benedict XVI said, “The full and visible Christian unity that we long for demands that we let ourselves be transformed and that we conform ourselves ever more perfectly to the image of Christ. The unity we pray for requires an inner conversion that is both common and personal. It is not merely a matter of cordiality or co-operation, it is necessary above all to strengthen our faith in God, in the God of Jesus Christ, who spoke to us and made himself one of us. “It is necessary to enter into new life in Christ, who is our true and definitive victory; it is necessary to open ourselves to one another, understanding all the elements of unity that God keeps for us and gives us ever anew,” Pope Benedict said. Pope Francis told the group in Caserta that one thing present among Christians since apostolic times, but definitely not a gift of God, was name-calling. On the path of Christian life, “when we stop and spend too much time looking at each other, we start a different journey, an ugly one”, the Pope said. In the First Letter to the Corinthians, St Paul criticises early Christians who, bragging and promoting rivalry, started saying, “I belong to Paul” or “I belong to Apollos”, rather than “I belong to Jesus”. “It is not the Holy Spirit who makes division,” Pope Francis told the Pentecostals. “The one who creates divisions is the jealous one, the king of envy, that sower of weeds: Satan! As he did in January when he recorded a video message to a group of United States Pentecostals on a pastor’s iPhone, Pope Francis used the Genesis story of Jacob’s sons selling their brother Joseph out of jealousy, only to be united with him again when they set off to Egypt in search of food during a famine.